Nineteen years after the conclusion of Glass and four children later, Kristina Snow is still a slave to the monster that irrevocably altered her life the summer she visited her father. Only now, it's her children's turn to tell the story. Alternating between the point of view of Kristina's three oldest, Hunter, Autumn, and Summer, Fallout chronicles their very different lives and the ways that Kristina's decisions have affected them, and how, even though they barely know each other, they each struggle with the very same issues of addiction, anger, depression, and disappointment in a parent who can never be the person they want her to be. Fallout is a powerful book and an entirely fitting conclusion to Ellen Hopkins' trilogy that started with Crank, based on her own daughter’s struggles with addiction. Flashing forward nineteen years into the future may have been a little unexpected, but it is the perfect way to demonstrate to readers the prolonged and far-reaching effects of addiction and bad decisions. Hopkins does an excellent job at steadily building up the story thorough her inventive and diverse poems, she creates a good amount of suspense by switching back and forth between Hunter, Autumn, and Summer, and it's not hard to draw parallels between mother and children. Hunter's story is engaging as he is one of the closest connections to the first two books, and he fills in a lot of gaps of missing information, allowing readers to piece together what has happened since his birth for themselves. Autumn, who is oblivious to her mother's identity and hardly knows anything about her parents, is a fascinating character and her struggles and desire to know where she comes from is emotional and even a little turbulent as she reaches out for human connection in any form. Readers will see a lot of Kristina in Summer, but Summer is also determined not be her mother, despite her mistakes that will try to lead her in that direction. She and her siblings, unlike their mother, have the consequences of bad choices and mistakes laid out before them, and live them every day, but yet they still grapple with temptation and each faces moments when they must make decisions that will dramatically alter their futures. There is plenty of great emotional depth throughout the book, but power of this final installment lies in the moment when Hunter, Autumn, and Summer look at Kristina and are unable to understand her, yet can’t help from seeing a part of themselves in her. This is an impacting and perfect conclusion to such a weighty and commanding trilogy, full of unexpected discoveries and mistakes, but also love, hope, and perhaps, redemption. Cover Comments: I like how rough these covers are. 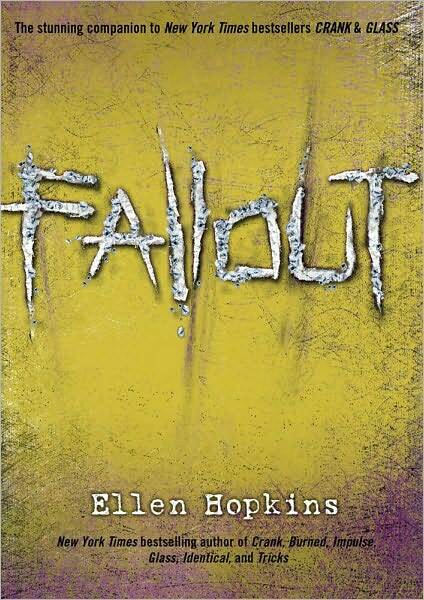 The green seems oddly fitting, and I like how Fallout is spelled with a combination of the powder (from the Crank cover) and glass (from the Glass cover). It's just right. Thanks so much, Tirzah! That ending took me two weeks past deadline because I wanted it to have exactly that impact. Three words, two weeks... not exactly efficient but, I hope, powerful.